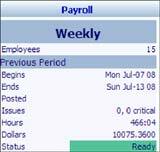 Easily make final adjustments to time and attendance information before sending it to payroll using the Payroll Monitor. There's no need to check all time cards, just review the ones with issues. Additionally, summary information about the gross labor dollars and hours worked by employees helps you estimate whether the organization is on track. The Scheduling section provides an overview of scheduling that can be helpful if several supervisors handle scheduling across departments. The HR section displays basic stats about your employees—whether they are full or part time, regular employees or on probation, and so on. The color-coded status of the Previous Period is easy to understand: Green means Go! In this case, one critical issue must be addressed before employee hour totals can be sent to payroll. Just click Issues to make any changes. When the issues are corrected, the status changes to Ready. Payroll is ready to be shared with your payroll system.